First contact: A Peter Gabriel of the late 1980s persuasion gazes seriously at the reader from the dust jacket; he is still unbearded, but still has the quiff of the So period. Without Frontiers is the title Daryl Easlea has given his book. Just a phrase from the lyrics, the announcement of a no-holds-barred biography, or is it aimed at something completely different? Time and the book will tell. The back of the dust jacket is black and shows a photo of Peter Gabriel circa Scratch My Back: older of course, balder, bearded, with an attentive gaze into the light. Whoever designed this knew their job: As on Gabriel's greatest hits album Shaking The Tree there are two portraits facing each other; while the front resembles the So layout in colours, clarity and even the typeface the rear quotes the Scratch My Back design with its black background, red and white print and, obviously, the photo. The fine design of the dust jacket and the overall book (solid cover, good paper, clear print) promise equally fine content. The birth of the book's subject is the obvious beginning for a biography. But that little devil that, as Gabriel once put it, "always makes me do it different from how others do it", seems to sit on his biographer's shoulder as well. Daryl Easlea begins with a moment that is quite un-Gabriel – his famous one-off concert with Genesis in the rain of Milton Keynes. From this moment he looks back and forth across the whole length of Gabriel's musical career and his social and political activities. 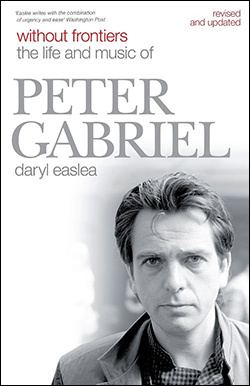 Easlea divides Peter Gabriel's life into 26 chapter bundled into three parts, to which he gives the remarkable titles From Genesis... (1950-1975), I Will Show Another Me (1975-1986) and ...To Revelation (1986-2013). Apparently, Easlea feels that Gabriel's musical work reaches perfection only from the So period onwards. As we shall proceed to walk through the book we do this mainly to demonstrate the aspects on which Easlea focuses. In Peter Gabriel’s childhood and school days the focus is on those things that are likely to have influenced his later career. Easlea stresses the interest Gabriel’s parents had in technology and music as well as the general tendency in the upper middle class of those days to support people who had unconventional ideas as long as they were ready to work very hard for their realization. The rise of The Beatles as well as soul and blues have been a major influence on Gabriel, as was, of course, meeting his later band mates. "The relationship between Gabriel and Banks was the foundation of Genesis and also the reason why Gabriel left the group a decade after its inception" (p.30), says Easlea, unfortunately without actually proving this point. Their shared experience of music gave them the idea of working as a songwriter’s cooperative; music at that time was not only a manual on how to structure songs, but also a "lifesaver" and, as Gabriel discovers at an Otis Redding concert, a way to let out emotions in a socially accepted manner. Hence there were many bands like Anon and Gardenwall in Charterhouse and also some concerts. Starting with the famous demo tape Jonathan King was given Easlea then depicts the development of Genesis as a band. He emphasizes Gabriel’s double role as a fanciful creator of musical ideas and down-to-earth organiser. After an extensive appreciation of Tony Stratton-Smith and Charisma Records Easlea outlines how, with the live shows and the positive reviews in the music press, success begins to appear for Genesis from Nursery Cryme onwards. Selling England By The Pound serves as a contemporary commentary on the political and economical situation in the UK. During the tour to promote the album (at the latest) a rift begins to appear in the band. This is due to the public’s distorted view of Gabriel as the only creative head of the band, the demanding tour rhythm and later on his desire to be with his new daughter. Easlea views the hermetic plot of The Lamb as a coded report of Gabriel’s search for himself. Reactions to the Lamb live show and Gabriel’s press release about his departure from Genesis mark the end of the first part of the book. The second part, entitled I Will Show Another Me, looks at Peter Gabriel’s solo career from his first post-Genesis songs to his big break with So and Sledgehammer. Apart from the collaboration with Martin Hall there are two pivotal songs for Easlea: Solsbury Hill, as a kind of closure from the Genesis years, and Here Comes The Flood, as a look ahead. Gabriel still needs to get used to having the sole responsibility for all his work in this period: The band who record his first solo album is assembled mainly by others. The sound of the second album is also marked by producer Robert Fripp as Gabriel deals with punk in an experimental fashion. Starting with Peter Gabriel’s third album, which contains his most overtly political song, Biko, Easlea examines Gabriel’s way into world music as well as political and social activity. Closely linked to this is not only the development of the fourth album but also the artistic success and the financial drama of the first WOMAD festival, the consequence of which was the reunion concert at Milton Keynes. The Security tour is affected by Gabriel’s rising popularity and private troubles, i.e. his divorce from Jill. After smaller musical contributions to various films Gabriel creates his first soundtrack for Birdy from fragments of his back catalogue. Easlea considers Birdy "one of the most important albums of his career, as it offered the first opportunity for him to think truly outside the conventions and structures of popular music" (p.240) But still it would be the album after this that would bring Peter Gabriel the big break: So. The second part ends, remarkably, with the anti-apartheid song Sun City. A discussion of the Sledgehammer video marks the beginning of the third part of Easlea’s work, …To Revelation. He emphasizes that Gabriel uses his star status for political activity and postpones his So promo tour for the Conspiracy Of Hope tour to benefit Amnesty International. The So tour grows even bigger and is laced with charity concerts. The money from the tour is invested in Real World Studios and the creation of the Real World label as founding stones of the long-term idea of a Real World amusement park. Passion, the soundtrack to a Scorcese film, confuses listeners; the hit compilation Shaking The Tree stops a gap to the next regular album: Us is the logical continuation of the accessible So and the world-musical Passion; it offers very intimate, self-searching lyrics – and the tour brings on his most theatrical stage show since The Lamb. Easlea's presentation of the years after that focuses on Peter's work for Witness, the success of his studios and the Real World Recording weeks before he returns, surprisingly, to Genesis and their Archive releases. It is quite ironic when Easlea writes about the Lamb concert on Archive 1967-1975: "Gabriel had agreed to overdub some of the vocals, as they had occasionally been lost" (p.311); comparisons with extant bootlegs show that "some" amounts to roughly a third of the recording and that even existing vocals were replaced. What is most discussed about OVO is, for the first time in this book, not the music but the controversy about the Millennium Dome where the OVO show was performed almost 1,000 times. Easlea then runs through Gabriel's activities pre-Scratch My Back: The 46664 concert for Nelson Mandela, various internet start-ups and the quickly mooted possibility of the classic Genesis five-piece. He puts more stress, and rightly so, on Gabriel's humanitarian activities, the continued support for Witness but also the creation of The Elders, a group of influential elder states(wo)men whose mission it is to move those things that cannot be moved through normal political channels. Big Blue Ball is briefly appreciated as the product of the long-part Real World Recording Week before Easlea turns to the next milestone: Scratch My Back with its evocative, no-frills orchestral arrangements, the "return singles" and the expansion of the orchestral concept to Gabriel's own songs in New Blood and the corresponding live releases. The So25 album is, by nature, a step back with its accompanying material and the North American live tour. The European Back To Front tour (of autumn 2013) is mentioned only in passing, the twin album And I'll Scratch Yours only in the afterword. The book begin with the gathering of the old Genesis line-up in the rain of Milton Keynes. It also ends with a gathering, the gathering of Peter Gabriel's friends to bury his father as a sad beginning to Gabriel's sabbatical. The title of the book is explained in the epilogue: It is called Without Frontiers, because Peter Gabriel does not accept any borders. He is a man who has "absolutely no word for 'no' in his vocabulary". Easlea also uses quotes from many of Gabriel's friends and his own words to try and pin down what, essentially, is Peter Gabriel. Almost everybody speaks of Gabriel's charme, a kind of magic, his ability to listen, his curiosity and boundless creativity. In the end it comes to a formula that would have been unbearably trite at the beginning of the book: "Peter is who Peter is." Without frontiers. 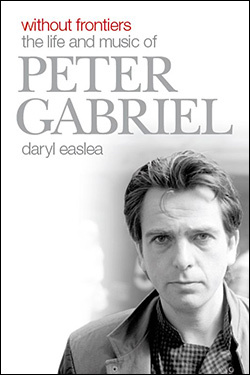 Readers should also take seriously the subtitle of the book, The life and music of Peter Gabriel. Easlea offers us a description of the music Peter Gabriel has made through the decades and weaves the description of his life around this discographical approach. The focus on the music remains strong throughout. The traditional approach of a biography, i.e. to describe what happened when and how things developed, fades into the background. Easlea takes the equally interesting approach to show "how it felt for people". This makes the presentation necessarily subjective, which is not really something to criticise: It is obviously impossible to describe the life of Peter Gabriel (or anybody else for that matter) objectively. The very selection of events that are portrayed is subjective; choosing and picking is the author's prerogative. Whether this goes as passing so strong a judgement on a song as "Gabriel's greatest, most succinct Genesis-era song... one of his best-ever melodies... the indisputable highlight of [the] album" (p.134) is something readers will have to make up their own minds about. Your mileage may vary. The weight each of the three periods (up to 1975, 1975 to 1986, 1986 to 2013) is given in the book seems a bit unbalanced. The first 150 pages cover basically Gabriel's time in Genesis, roughly a decade. The decade after that is contained in 120 pages, while the 26 years after that have to make do with some 100 pages. There is certainly nothing wrong in taking a closer look at the formative early years, but that era is well-covered by the many books about Genesis, not least Chapter & Verse. It would have been intriguing to hear more about Gabriel's many activities outside the music. After all, Gabriel is quoted in the book as saying that music takes up only a third of his time these days. But then the book is more about his music and less about other activities, so covering that is perhaps up to a desirable update of Spencer Bright's book. Unfortunately there are a number of mistakes in the 2013 edition of the book: Easlea moves the Chernobyl disaster a year forward, one of the groups that formed in Charterhouse is called "The Anon" in this book and the inevitable press photo of the band from their From Genesis To Revelation time supposedly shows, according to the caption, John Silver. However, Anthony Phillips explains in Chapter & Verse why the band was simply called "Anon" (sans article) and Chris Stewart explains in the same book that it is he, not John Silver in the photo. Renaming Dr Dyper (from The Lamb) to Dr Diaper is one of the funnier mistakes. These things have all been corrected in the 2018 edition. What is commendable is the extensive bibliography that also lists numerous websites (genesis-news.com included). Since Easlea paints many episodes in a different light than what the reader knows from Chapter & Verse and Spencer Bright the only thing one could have wished for was the odd footnote pointing out the source. It is regrettable that this was not added in the 2018 edition. Daryl Easlea has written a good-to-read discography with discussions of the songs and biographical notes. It is particularly relevant for the period from Us onwards, where Chapter & Verse as well as Spencer Bright's biography end or stop going into details about Gabriel's solo work. Easlea talks about his subject comprehensively and with a clear line. The outcome is a book worthwhile reading. A new edition labelled „revised and updated“ has come out in March 2018. It comes as a paperback in a slightly smaller format and it is far less expensive than the out of print hardcover original edition that tends to command rather stiff prices. The table of contents has changed remarkably little. The chapters even begin on the same pages as in the original edition. Chapter 27, “Dream Big And Let Your Imagination Guide You” and a postface by Richard Macphail are new. The discography and the acknowledgements have also made it to the table of contents. Of course, the index now also refers to items from chapter 27. The new chapter deals with the period after Gabriel’s self-prescribed sabbatical. When he discusses the European leg of the Back To Front tour Easlea stresses the acoustic part with its inclusion of new and partly incomplete songs. He discusses a satirical mock documentary called The Life Of Rock With Brian Pern, whose title character is obviously a caricature of Peter Gabriel. Original plans were for three episodes, but in the end BBC4 broadcast three mini-series and a tribute. Richard Macphail’s “postface” outlines how he saw Peter back in Charterhouse and today: a very determined person with an interest in all kinds of things who promotes new technologies as much as a better and peaceful coexistence of mankind, a man of courage, boundless imagination and loving generosity. The discography lists all of Peter Gabriel’s UK album releases, the DVDs, his releases with Genesis (including the 2007 remasters) – all of those with track listings, though the Encore CDs only have “typical setlists” for obvious reasons. A selection of his single releases and collaborations follows; the excellent special on our fanclub website indicates how nearly boundless a topic that is. Of course, leaving out the singles and collaborations would have prompted the criticism of incompleteness; listing all of them would have been way beyond the scope of the book. It has evidently been decided to list something of a representative selection. There are only minor changes from the original edition: The remark on how Peter Gabriel’s first four solo albums were named has been moved from the end of the prologue to the end of the table of contents. The three blocks of photos are still there; only the first and the last photo from the third block of photos have switched positions. The text of the original edition has remained unchanged, except for corrections and the additions discussed above. Unchanged to a degree that the pages of the paperback edition are identical to those of the original (up to the beginning of chapter 27, obviously). Without Frontiers (revised and updated) has grown by 14 pages (plus two pages postface by Richard Macphail). These fourteen pages cover the years 2013-2017 and they do not really contain revelations. If you already have the original edition you may give the new edition a pass. But whichever edition you get, it is a book worthwhile reading! It's also available as an iBook, i.e. via iTunes.